Today I am reviewing an excellent product, which is both a recent launch and buy. 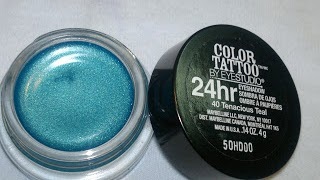 The product is the much raved Color Tattoo by Maybelline. There were six varients available when I had gone to purchase it but I was fascinated by this beautiful teal blue color, that in the end I purchased this only. Price: INR 350 for 4 gm of the product. Packaging is very classy, a sturdy glass pot with black lid, reminds me and everyone else in the blogoshpere of the MAC paint pots. 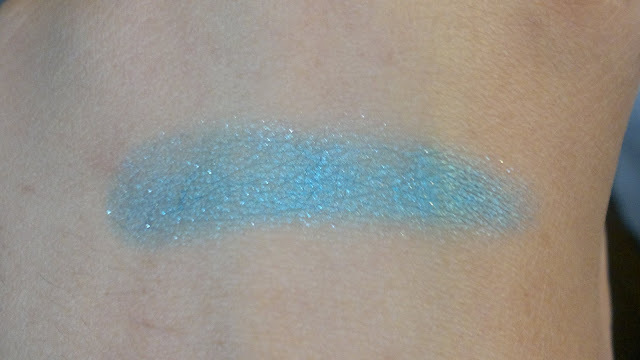 As you can see from the swatch above, the color has fine silver shimmer which is not gritty at all, The color goes on smoothly on my lids and is pretty pigmented. The lasting power of this one is quiet awesome, I have wor it for straight 6 hours without any smudging. 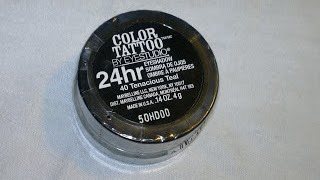 This forms a great base for my smokey eye makeup as well. A great shade for the upcoming festive season, must say. Product rating: A, available at all Maybelline counters. Highly recommended for the excellent quality and price. Do get one now.